Jace takes a look at a couple of recent Top Cow titles. 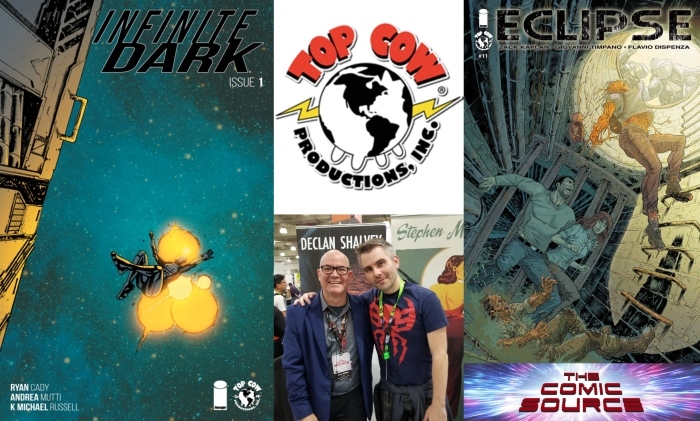 In both Eclipse and Infinite Dark, the writers Zack Kaplan and Ryan Cady respectively have come up with big ideas for the worlds they are building. You get drawn in by those fun worlds, but you stay for the amazing characters these two creators have inhabited those worlds with. Plus a quick chat from New York Comic Con with Stephen Mooney about The Dead Hand. History with comics; grow up reading them? Remind our listeners about The Dead Hand, what’s it all about? The art so accurately captured the tension, paranoia and anxiety of the Cold War, what was it that you infused into the art that you feel helped you accomplish that so well? When illustrating super hero stories there is an inherent visual excitement to some extent because you are depicting these images of heroes doing things that are literally impossible.Is it a challenge to keep thigs exciting in a book like the Dead Hand where the events are relatively more true to life? What is some advice you would give to an artist starting out on how to keep things visually interesting when doing talking head panels or some of the more slice of life type stories? We would love to see more stories of Carter and Natasha in this world of The Dead Hand, especially pre-Roger, on a scale of 1 to 10 how would you gauge your desire to return? Any other projects coming up we should be on the lookout for?